Readdle’s Air Sail is a charming but diabolically challenging racing game with cute graphics and a clever interface. To propel your makeshift styrofoam boat, you must blow into your iPhone’s microphone. The harder you blow, the faster you go. But be careful: Blow too hard, and you’ll lose control. Well, Blow Me Down: Blowing into the microphone of the iPhone—or tapping, if you prefer—propels your watercraft in Air Sail. You can race against time or against another player in multiplayer mode. The courses get progressively difficult over 15 levels. That little boat is swift, but hard to control, as you try to tilt your handheld device left and right while blowing furiously into the mic. Adults may not like the game as much as their children will. 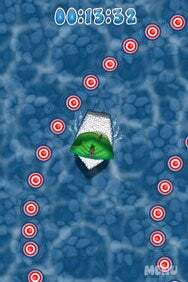 I found the game maddening at first, with the boat veering wildly into the course barricades no matter how hard I tried or however subtly I attempted to navigate. I only got the hang of it after several frustrating attempts. My 6-year-old son, naturally, mastered it right away. Air Sail is compatible with any iPhone or iPod Touch running the iPhone 2.2 software update.